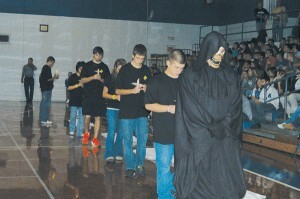 The Grim Reaper leads victims in to the Estill High Gym during Ghost Out last Friday. Estill County Coroner Tony Murphy talked to the students about how terrible his job is when he has to notify family members that a loved one has died on the highways. Two students read poems about teenagers who were killed in drunk driving accidents and a representative from the KDHS spoke to the students. The “Grim Reaper” visited 14 students in their classrooms during the day, leading them away and hiding them. In the afternoon he led them into the gym, each holding a candle. They stopped next to 13 sheets laid out on the floor. As Brother Keith Sands of Calvary Baptist Church stood in front of an open casket and read a mock obituary about each student that revealed they had died either by making the decision to drink and drive or coming in contact with somebody who had made the decision. The sound of quiet sobbing could be heard coming from the bleachers as Bro. Sands read off the names. At times his voice cracked with emotion as he read the names and as he finished each mock obituary, members of the Estill County Emergency Services staff laid the student gently on the gym floor while others covered them with a white sheet. The last student standing refused to go with the “reaper” and pulled out a cell phone to call his parents to come and get him instead. 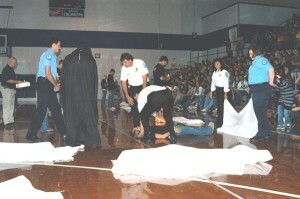 It was a well-done enactment that appeared to have a big impact on the students.